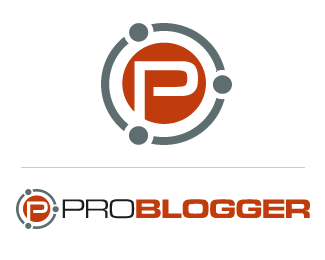 At the end of May, Darren Rowse contacted me through MakaluMedia, to redesign the ProBlogger logo. Darren has one of the net's most popular blogs, and is one of the founders of b5media. I was honored to have a chance at designing the new identity, so I agreed to come on board the design team with Darren's site designer, Ben Bleikamp. Darren's story is interesting, not only because he turned blogging from a hobby into a full-time career and business, but because he freely shares what he's learned from blogging. I quite like Darren's attitude of helping others grow and succeed by sharing his knowledge. In this post, I'll share details and sketches on the new ProBlogger identity. Darren wanted a clean, crisp, contemporary, professional logo, without superfical "Web 2.0" stylings. He wanted a logo to represent himself and his blog, in a design that wouldn't go out of style in 6 months. With all of this information in mind, I began sketching multiple concepts to get the project rolling (click the image to see the v1 sketches). With all of my logo projects, I like to loosen up with pencil in my Miquelrius notebook, freeing my mind to explore ideas. Note the keywords on the upper right of the page, which help guide me in idea generation during this first sketch phase. I focused on theProBlogger P, as it portrays the brand well, and would be a consistent element from the original design. I explored one other idea (8) which suggested community as a nucleus with network connections and multiple outer atoms. In Darren's feedback, I learned that he liked the emphasis on the P. He preferred the squarer P characters, as these leaned away from the "surf" look and feel he saw in ideas 17, 18 and 19. He also liked the community concept he saw in 8, so it was on to v2 sketches to explore those ideas a bit more. I this set, I explored the winning concepts and a few others, bringing in aspects of idea 8 and the community "atomic" ideas merged with the P character. After review, Darren and his team of trusted advisers focused on two ideas from this v2 set: concepts 19 and 23. Next up was the black & white and color phase. Because Darren was on a tight timeline, I changed my normal process, including both black & white and color logos on the same mockups. This way Darren could see the B&W ideas and some explorations of initial colors. Darren's feedback from round 1 aimed us at the P within a nucleus circle with orbiting atoms around this central icon to embed the concept of comminity into the mark. While the more graphical representations of this community were interesting (1, 2 and 3), the clearer P emerged as Darren's top choice. Darren was pleased with the final logo, which was subsequently included in Ben's redesign of the site. It was great fun to see the logo announced on Darren's blog, followed by the release of the new site design. As one might expect, with a major change on a popular site, there were a few who liked the old design better. However, after reading comments on the site related to the new logo and design, a majority of Darren's readers really loved the new site design and logo. Most importantly, Darren was pleased with the results. Thanks Darren for choosing to work with me and MakaluMedia on the logo design. It was an honor and a pleasure working with Darren and Ben on this project. Very nice, Mike. I like the "high-end" look without the Web 2.0 fluff. Side question: could you share how you created the shading effect on the article thumbnail images? I've tried a couple of different techniques to achieve a similar effect, but I've never been very happy with the results. Yours are quite nice though. Thanks Jason, glad you like the design! Shading effect: I like to add a new layer above the images in photoshop, and used the 300px airbrush with black at 100%. I come in slowly from off-canvas toward the edges and smoothly lay in the tone. Finally, I hit the airbrushing with a gaussian blur at around 2.0. On point as usual. What font did you use in 3b? Is it the same as the one used for Bloglines? Angel, each logo takes different amounts of time, but generally a fair amount of hours to go through the entire process. Justin, that font is ITC Officina Sans. I love the font because it's friendly, readable and a little quirky. Font in 3a is FF Meta. Mike, did you take any inspiration for the logo from the Ubuntu logo? They have similar characteristics, but I think I agree that the leading circle makes a stronger statement. That said, my question about the price was what you could call random curiosity. I just wanted to get a tiny glimpse of prices outside of Spain; one of my partners is going to Germany for 8 or 9 months and will (hopefully) find new customers there, so I guess that sort of justifies my curiosity.We have gotten to a point where we charge around 3K (euros) for developing a basic corporate image (logo, color treatments, basic stationery... plus a printed version of the manual), thus my question about your prices.If you don't want to answer that question, of course that's ok.Thanks again for taking the time. Jamie, I didn't get any inspiration from ubuntu directly. I have seen the logo in the past, but not lately, so the similarities are purely coincidental. Mike, great job on the logo. I love how you offer up your thoughts and sketches for the world to see. Also, nice job on Phil Gerbyshak's new header. Keep up the great work! August 30, 2007 | Jason of "Kim & Jason"